Church communications isn’t an easy job. Because it brings together many factions of a church, it lends itself to being an area of conflict. People in different departments want to silo up and keep independence. Communications issues often evolve into bigger, tougher conversations about the vision of the church or what programs are working. Because of that, church communications takes commitment. Here are a few ideas for how you can strengthen the communications work you’re doing. Put someone in charge. In smaller churches, this is a single person. In larger churches, it might be a small team. But someone has to be the coordinator, filterer and strategic touch point for communications. They have to be able to simplify complex issues, embrace the church’s vision by working it into communications, understand the voice of the church and set communications priorities. An ideal communications leader also has to be firm in decision-making but also a people person who can build relationships with other key people in the church. Give them authority. Once a communications person is in place, church leadership has to empower them to do their job. This means making sure everyone works with this person while not letting particular ministries go rogue. Giving authority also doesn’t mean abandoning the person. Support comes by endorsing this person, encouraging them and creating a church vision a communicator can share. A church communicator can’t succeed alone. Create a communications plan. A communications manager can’t work on a whim. There has to be a structure that explains how things are communicated, why it’s done that way and how people can make communications requests. 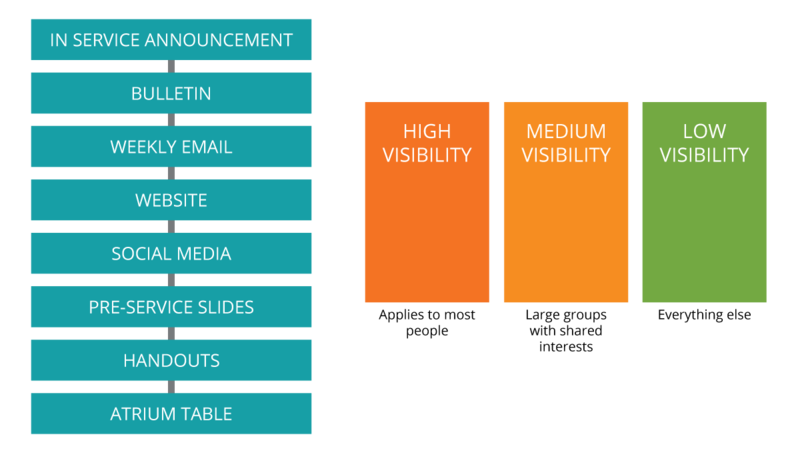 Some choose to have a communications hierarchy where the most broad reaching communications mediums are used to share information about the most important church initiatives. Other events with less mass appeal are promoted in less far reaching mediums. The hierarchy will look different for every church. Dawn Nicole Baldwin also presents a way of grouping communications by high, medium and low priorities. 2013 Juicys winner Elmbrook Church uses a similar system and provided their communications matrix for free. Below are graphical examples of both strategies. Stop the leaks. When there is a communications system in place, everyone in the organization needs to respect it. If a pastor slips in an extra couple of announcement items because someone caught his ear, then the system loses credibility because people begin to realize there are ways around the structure. It’s not easy creating and implementing a communications plan. It’s even harder to show that it’s working if people aren’t letting the process prove itself. Beginning a church merger experience.. Lots of helpful information.